Gunmen attacked a military parade in the Iranian city of Ahvaz on Saturday, killing at least 25 people and wounding 60 others. At least 25 people are dead and 60 others wounded after gunmen fired on a military parade in Iran on Saturday, according to Iranian state-run news outlet IRNA. IRNA reported that civilians, including women and children, who were watching the parade in the southwestern city Ahvaz, are among the dead and injured. Gunmen disguised as soldiers in military uniforms began shooting from behind the stands during the parade, according to the state-run news agency. Videos on social media show soldiers in uniform and civilians dropping to the pavement and running for cover, as gunfire rings out in the background. The attack lasted about 10 minutes, the BBC's David Bamford told NPR. State media called the attackers terrorists and reported that all four gunman were killed. "Terrorists recruited, trained, armed & paid by a foreign regime have attacked Ahvaz," Iranian Foreign Minister Mohammad Javad Zarif said on Twitter. "Iran will respond swiftly and decisively in defense of Iranian lives," he wrote. Zarif also said journalists were among the victims, but that has not been confirmed. NPR's Peter Kenyon reported that initially, attackers were described as "takfiri gunmen" by news agencies, a term sometimes used to describe Islamic State fighters. But in the hours after the attack, state-run media reported the Al-Ahwaz separatist group claimed the responsibility for the attack. Arab separatists groups have operated in the region for years, according to The New York Times. The separatists are previously only known to have conducted oil pipeline bombings at night, The Associated Press reports. 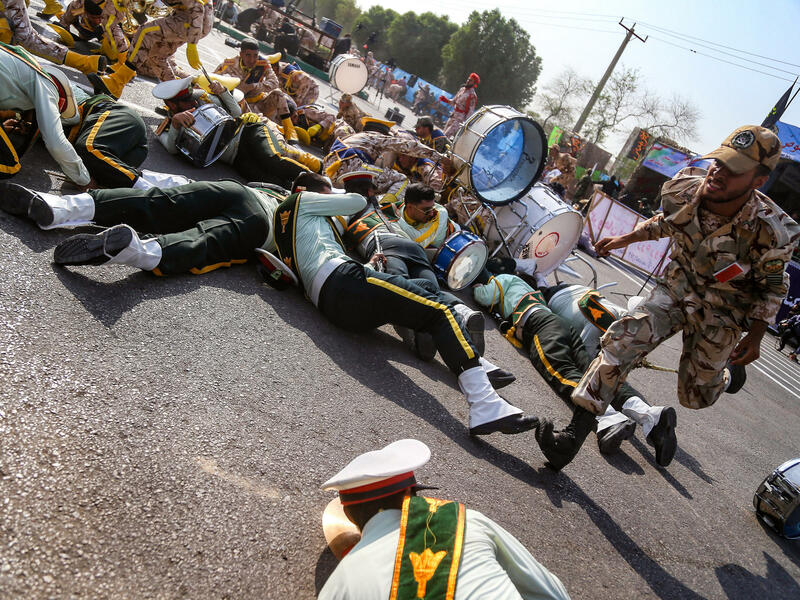 The parade in Ahvaz, a city with a population of more than a million people, was one of many happening nationwide in honor of Sacred Defense Week, marking the 38th anniversary of Iran's eight-year war with Iraq. The U.S. State Department said it was aware of reports of the attack, in a statement emailed to NPR. "We stand with the Iranian people against the scourge of radical Islamic terrorism and express our sympathy to them at this terrible time," State Department spokesperson Heather Nauert said. "The United States condemns all acts of terrorism and the loss of any innocent lives."